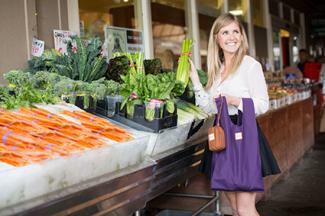 Cloth grocery bags are an eco-friendly, practical, and affordable alternative to disposable bags. Using cloth bags helps the environment by reducing pollution and conserving energy, and switching to reusable bags can save you money in the long run. Cloth bags are available in a variety of materials, including cotton, hemp, linen, and burlap. In addition to standard tote bags, some cloth grocery bags have shoulder straps, zippers, and multiple compartments, which is handy when carrying many smaller items. You can find bags in many different colors, some solid and some with patterns or other designs. 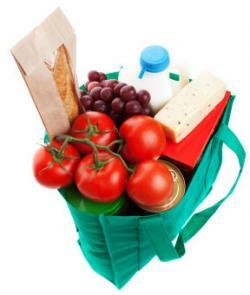 Cloth grocery bags are widely available, with increasing numbers of stores offering them to customers. You can purchase them online or in your local retailer, or you can opt to make your own. You can find cloth grocery bags online with little effort. URBAN MARKET BAGS conveniently come in stylish packs of 3 or 6 and are made out of a fashionably durable nylon, withstanding years of wear and regular washing. Each one holds 20% more than a standard plastic bag and user comfort is at the forefront of the bags' design technology. Available in bright colors, these packs make sustainability fun. ECOBAGS offers a large assortment of cloth bags in several materials and sizes. Printed and woven bags are also available, and the site allows customers to customize bags to include a logo or slogan. Enviro-Tote sells bags made from certified organic cotton, unbleached and colored cotton, and 100 percent recycled soda bottles. All products are manufactured in the United States. You can also find cloth bags in your local community. Cloth shopping bags are available from most major retailers and grocery stores, and in some dollar stores and craft stores. Check your local thrift stores and flea markets for cloth bags. You can also try browsing your local Craigslist or Freecycle. You may not even need to purchase new cloth bags; many people have unused canvas tote bags laying around the house or stored in closets. Tote bags are also offered as free gifts with membership to certain clubs and organizations. Switching from plastic or paper to cloth bags is easy. Determine how many bags you will need to transport an average load of groceries, and then browse for bags in the appropriate size and style. Cloth bags are durable and long-lasting, they do not tip over, are not prone to tears, hold more than plastic bags, and are significantly better for the environment. Plus, switching to cloth can save you money over time.